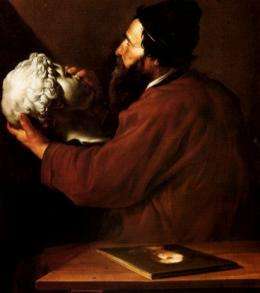 'The Sense of Touch,' by Jusepe de Ribera, depicts a blind man holding a marble head in his hands. More than 300 years ago, scientist William Molyneux posed the following puzzle: Imagine a person blind from birth who suddenly is able to see. Immediately after gaining sight, would he be able to visually distinguish between objects that he could previously identify by touch? Ever since then, this has been one of the foremost questions in the philosophy of mind, says Pawan Sinha, professor in MITs Department of Brain and Cognitive Sciences (BCS). However, the question remained only a thought experiment for centuries, as there was no good way to test it  until now. In a study of blind patients in India whose sight was restored in late childhood or adolescence, Sinha and his colleagues found that the patients were not immediately able to make the connection between what they saw and what they felt. However, they acquired that skill within days after surgery. The findings, which appear in the April 10 online edition of Nature Neuroscience, suggest that the answer to Molyneuxs question is no. The brain does not have an innate ability to connect different types of sensory input; however, it can quickly learn to do so. Most cases of blindness in India are caused by vitamin A deficiency, cataracts, retinal or optical dystrophies, or microphthalmos (poorly developed eyes). About half of these cases are treatable or preventable, but many blind children never receive medical care, especially in rural areas. Since its founding in 2004, Project Prakash has screened more than 24,000 children and treated about 700. The latest study is a good example of Project Prakashs dual mission, says Sinha. These children have been treated and their lives have hopefully been improved, and that has also allowed us to answer a question that scientists have been puzzling about for over three centuries, he says. Sinha, who has published several other research papers on Prakash patients, started this study at the suggestion of Richard Held, MIT professor emeritus of brain and cognitive sciences, who is also an author of the paper. Starting with a 2007 trip to India, the researchers tested five patients on the Molyneux question, ranging in age from 8 to 17. Each had been born blind (four with congenital cataracts, one with corneal opacity). Each subject (who agreed in advance to participate in the study) was tested within 48 hours of surgery, shortly after his or her bandages were removed. In the first test, the children were shown a novel object made from plastic parts, which was then taken away. Then they were shown two objects and asked to identify the original one. That test establishes that the children can see well enough to identify the relevant properties of the object, and that they understand the task. The patients performed this test with more than 90 percent accuracy. The patients also performed well in a test where they had to identify, by touch alone, an object that they had earlier handled. Finally, the patients were asked to visually identify an object they had previously held. In those cases, their answers were not much more successful than if they had guessed. However, when the researchers tested the patients again, in one case just a week later, they showed dramatic improvement in the touch-to-vision test. The children were tested with different objects than those they encountered during the first session, and they did not receive any kind of training between the two sessions. This rapid improvement was surprising, says Yuri Ostrovsky, a BCS postdoctoral associate and an author of the paper. He points out that many visual tasks, such as face perception, can take six to 12 months to learn after sight is restored. The researchers believe that the brain learns to make connections between different types of sensory input by analyzing the timing of each stimulus. For example, when you look at your cell phone and hear it ring, your brain receives time-synchronized inputs from different senses. The brain essentially has to look at the time sequence and figure out the correspondence, Sinha says. David Somers, associate professor of psychology at Boston University, described the experiment as very elegant and said the Project Prakash studies have made valuable contributions to neuroscientists understanding of brain development and plasticity (the ability to change in response to sensory information). In ongoing studies, Sinha and his colleagues are using brain scans to look for brain regions that may be activated by a certain object, no matter what type of sensory information comes into the brain. For example, they can scan a persons brain while he or she looks at a pattern of lines, and then scan again when the person is given a tactile pattern with a similar set of lines. If any part of the brain responds to both stimuli, it would suggest that that brain region encodes that pattern, regardless of the sensory modality through which it was detected. The overall goal of the effort is to understand the learning process through which the visual world begins to cohere into meaningful objects and is linked with information from the other senses, says Sinha, adding that Project Prakash provides a unique window onto this developmental process. "Empiricists believed that we are born blank slates, and become the sum total of our accumulated experience." -And how would they know? "So-called "nativists" countered that our minds are, from the outset, pre-stocked with ideas waiting to be activated by sight, sound and touch." -And how would THEY know?? -But they continued to discuss it ad infinitum, as if discussing could actually inform them about the world. And they made sweeping and authoritative (though conflicting) conclusions based on their endless discussing about how things 'must' be, or 'probably' were. "More recently, this "nurture vs. nature" debate has found its counterpart in modern neuroscience." -But, because of the astute inertia of decisions made by empiricists, nativists, and other such -ists, their conclusions are still considered valid today by competing factions of philos, even though science has proven them worthless. But then after all, their job was to make decisions like the pseudoreligionists that they are, and the people fully expected them to do so. And so they did, even when perhaps they knew that it was not appropriate for them to do so. They belonged to an academic dicipline that was expected to bear fruit. Their forebears all promised that it would, and had, just like any priest would have. And because we have a method of inquiry today which we know is the only way which can inform us about the world, we can also conclude that whatever conclusions they arrived at were plain rubbish. And if any of these conclusions should chance to coincide with what science has told us, then we also know that it has to be pure coincidence. The puzzle, he continued, is "Whether he Could, by his Sight, and before he touch them, know which is the Globe and which the Cube?" Using objects that looked like Lego building blocks, they tested the ability to discriminate visually between similar shapes. The subjects scored nearly 100 percent. The subjects should have been given the objects to examine, and the names of the shapes, prior to the operation, and post-op have had the objects physically displayed to them, and asked to name them. Why ask them to make fine distinctions among surface details, when many sighted folks couldn't? So, even though these clowns had the chance to test the "Molyneux Question", they blew it. What they did manage to highlight, however, is that the human sensorium is a highly complex, INTEGRATIVE system, designed to ascribe the maximum amount of useful detail to any object of examination, in order to be able to understand and interpret its nature holistically, in order to place it into a global informational context. The fact that sight was so quickly integrated into this overall framework is the important finding here, and Molyneux's question continues unanswered. Molyneux clearly knew few if any blind people. The fact that his question was given enough serious consideration to prove - says more about the researchers intellectual inabilities than Molyneux's. Imagine, William Molyneux wrote to the great British thinker, that a man blind from birth who has learned to identify objects -- a sphere and a cube, for example -- only through his sense of touch is suddenly able to see. This stumped someone? It's obvious he would be able to build the shape in his mind from touch and recognize it as soon as his eyes adjusted to seeing in 3D. The key is adjusting. The mind probably needs a bit of time to learn to process the images from 2 eyes to recognize a 3D image. All obvious. I'm guessing that the cube is the one with pointy points. Do I get to keep it? I also agree that after vision is acquired, it must be 'calibrated' to see things so that the perception matches other senses. There has been studies with 'upsidedown' classes that show adaptation times of some weeks. After that adaptation time people learn to orient themselves correctly even with these classes that turn the picture on retina 180 degrees turned compared to normal (which is upsidedown!). Readjustment time is much shorter back to normal and back to glasses after it is first learned. Similarly people 'new' to vision must learn how to integrate it, before they can use it effectively. It sounds like the experiment did in fact test Molyneux's question. The subjects were given two different shaped objects pre-sight and were told their names. Once sight was restored they were shown the same objects but could not identify them. You must be philo then? Of which particular -ism are you? Like any science it is learning as it goes and is also susceptible to unscientific influences. As philospeak is not concerned with experimentation or repeatability or much of the real world at all, it is susceptible to anything and nothing. Like religion it thrives on the unscientific. This is evinced by its use of nonsense words which are good for explaining what it does because they SOUND as if they do. And of course like religion it attempts to commandeer such weighty concepts as 'morality' and 'freedom', and pretends that it invented them, and has stewardship of their meaning and proper use, which it obviously does not. I could go on but you get the point. Scientific inquiry intends to lead somewhere. Philosophy only intends to convince others that it does, but it never has and never will. Using objects that looked like Lego building blocks, they tested the ability to discriminate visually between similar shapes. Last time I checked, comparing SIMILAR(cone and pyramid, maybe?) objects is not the same as comparing DISSIMILAR(cube and sphere, as per Molyneux) ones. "Chase is not a vegetable, leaving doctors bewildered and experts rethinking what they thought they knew about the human brain. "There are some very bright, specialized people across the country and in Europe that have put their minds to this dilemma and are continuing to do so, and we haven't come up with an answer," Dr. Adre du Plessis, chief of Fetal and Transitional Medicine at Children's National Medical Center in Washington, D.C., told Fox News affiliate WGRZ." -I'm not sure what you're saying. Are you saying we should abandon the only method of inquiry which has a hope of explaining this strange condition, just because you feel it ought to be explaining it RIGHT NOW? You want some priest or some wizard to explain it for you then, which would tell us nothing about what it is, what caused it, or how to avoid it in the future?? Is that really what you're trying to say??? Good thing science has the guts that people like you don't. Neuroscience's best approach to Chase Britton is the rug - the great sweep underneath. That is the "scientific inquiry's" intention here. Never let the truth get in the way of make-believe science - specifically neuroscience. And if you are hard pressed for some real science, call it plasticity. Neuroscience does. Chase Britton has proven neuroscience worthless. So you're saying you didn't read the actual journal article? At the bottom of most articles on this website is the link to the actual publication of reference... you should read those, not just physorg's three paragraph synopsis. Good catch thales. People like hush are even willing to accept lies when they reinforce their preconceptions of right and wrong. Along those lines... I find it quite irritating when people who criticize publications in respected or even top tier scientific journals (such as Nature) have the audacity to do so without even reading the article... Who do you think you are? I suppose that you are mainly right with that criticism. I should have made it more plain that my post concerned the substance of the PHYSORG article, as opposed to the source document.